Elisha Atkins (1813-1888) began importing Cuban sugar to the US in 1838 and in 1843 began trading in Cuban sugar through the firm Atkins & Freeman, a partnership with William Freeman, a relative of his wife, and after 1949 under E. Atkins & Co.
By 1887 E. Atkins & Co. had owned the Bay State Sugar Refining Co. in Boston for about ten years, acquired in payment of an indebtedness. Bay State was one of the 17 sugar refineries consolidated in 1887 to form The Sugar Trust (restructured in 1891 as the American Sugar Refining Co.) under the direction of Henry O. Havemeyer . A stockholder since its organization in 1891 and a Director since 1910, in 1920 when Edwin F. Atkins resigned from the Board of the American Sugar Refining Co. he was one of the largest and most influential stockholders of ASR and had been closely associated with the development of the company to its prominent position in the sugar industry. Elisha’s son, Edwin Farnsworth Atkins (1850-1926) began working with his father in 1864 and was sent to Cuba rather than to college in 1869 to learn the business from the elder Atkin's agent in Cienfuegos, Ramón de la Torriente and to protect the family's interest on the island. In 1874, then 24 years old Edwin became a partner in the firm. The damaging effects of the Ten Year War and the sugar price crisis of 1884 forced some Cuban sugar houses into bankruptcy. E. Atkins & Co. had financed some of these sugar houses and, as a result of the crisis, became the first US firm to own large sugar estates and become a sugar producer in Cuba. 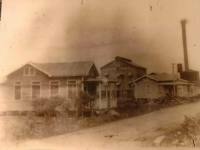 Their first acquisition in 1883 and one of their major ones was the Soledad plantation. Although he had not been involved in the sugar manufacturing business before, in May 1884, E. Atkins & Co. became involved in it when in lieu of payment it acquired the Soledad estate and sugar mill from its agent in Cuba, the firm Torriente Bros. Even though sugar manufacturing was not in Elisha’s plans and Edwin lived in Belmont, Mass., the operation of Soledad became Edwin’s personal interest and by 1887 Soledad was producing 4,000 m.t. of sugar annually. The Soledad plantation was established by the Sarría family as a medium sized sugar estate of 900 acres and 180 slaves according to the census of 1877.1 In 1881 the mercantile firm Torriente Bros. acquired the mill for unpaid crop financing loans made to the heirs of Juan Bautista Sarría who had established it in 1820. 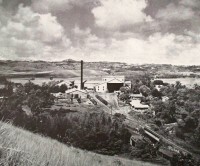 Central Soledad eventually became part of Punta Alegre Sugar Co.
Another of Atkin's big acquisitions was Central Trinidad which was incorporated in New Jersey in 1892 by Henry O. Havemeyer (40%), his cousin and business associate Charles Senff (40%) and Edwin F. Atkins (20%). its organization was prompred by the adoption of the McKinley Tariff of 1890 which reduced duties on Cuban sugar imported to the US. During the 1880s E. Atkins & Co. also acquired the Rosario plantations of the Rosario family, Carlota of the Torriente family, Caledonia of the estate of Diego Julián Sánchez, Guabairo of Manuel Blanco and Limones of the Vila family. Vega Vieja and Manáca were purchased from the Yznagas, Santa Teresa from Juan Perez Galdós, Veguitas from José Porroa, Vaquería from the Barrallaca family and San Augustin from the estate of Tomás Terry y Adán. In addition to his involvement in E. Atkins & Co., Punta Alegre Sugar Co. and the American Sugar Refining Co., Edwin F. Atkins served on the Board of Directors of the Union Pacific Railroad, Aetna Mills, Boston Wharf Co., American Trust Co., National Shawmut Bank, Second National Bank of Boston and Westinghouse Electric. In 1921 Frank C. Lowry of the Federal Sugar Refining Co., Eugene V. Thayer, past president of the Merchant's National Bank of Boston and Chase National Bank of NY and Horace Havemeyer joined E. Atkins & Co. Upon Edwin F. Atkins death in May 1926 they took over E. Atkins & Co. and operated it under the name E. Lowry & Co.